Yahoo! Web Analytics (formerly known as IndexTools) is an enterprise level web analytics tool that provides real-time insight into visitor behavior on your website. There has been a lot of talk recently about bailouts and the stimulus packages. I had an opportunity to review several pages of the most recent stimulus package proposed by President Obama and it has promise but lacks the long term focus needed to drive development to match the development that lead to the greatest prosperity in U.S. history. The greatest leaps in advancement in our society occurred when we invested heavily into the sciences. When Neil Armstrong uttered the words "That's one small step for man, one giant leap for mankind", it was a little known technology contractor (named Motorola) that built the radio transponders for the Apollo missions to the moon. Subsequently, this wireless communications technology helped to spawn the mobile phone revolution. The United States has a golden opportunity to lead the world again. We as a country and a world leader should invest in scramjet technology and carbon nanotube technology. ScramJet (supersonic combustion ram jet) is a new concept in jet engine design. In concept, a scramjet traveling a suborbital flight path could reach speeds up to Mach 24. In other words, a scramjet could travel from New York city to Tokyo in less than 45 minutes. One of the things that prohibit us from exploring outer space in an unrestricted fashion is the huge costs to lift people and cargo into space. It costs about $11,000 to lift 1 pound into orbit. Space shuttle missions costs millions of dollars to operate. One way to drastically reduce the cost of space travel is the build a space elevator. The concept is very similar to children’s story “Jack and the Beanstalk”. In the story, Jack climbs a long beanstalk up into the clouds. With a space elevator, a satellite in geosynchronous orbit above the Earth would be tethered by long cable 105 miles in length. Centrifugal force by the spin of the Earth would maintain the tension of the cable. Once in place, one could simply ride the space elevator up into outer space at a price of about $10 per pound. Currently, there is no known cable material which could withstand the stress induced by the space elevator concept. In theory carbon nanotubes could meet the challenge. Carbon nanotubes are a concept in quantum chemistry which make for an extremely strong and light material. This material would be many times lighter and stronger than the strongest steel or titanium. Cables made from carbon nanotubes would be the center piece behind the space elevator concept. 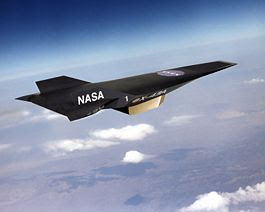 Potential scramjet manufacturers like Boeing and McDonnell-Douglas would see a huge increase in revenue which would spawn additional investments in research and development. Inexpensive space flights could lead to advancements in manufacturing, medicine, physics and agriculture just to name a few. Similar to the unforeseen benefits of the space race technology investments and the World War II technology investments, the benefits of developing scramjets and carbon nanotubes go far beyond the short term tangible benefits.